The Village Hall in Millbeck was built in 1896 on land which as originally a pinfold for stray animals. The initial cost was £233.6s.10p for the large room on the right. It was extended in 1928 with the addition of the small room on the left and the kitchen. In 1951 toilets were added and in 1952 work was done to the foot of the wall in the beck to protect the foundations. In the early days the hall was used for evening classes, concerts and dances. On a day to day basis it was used as a reading room for the young men, who were mainly farmhands, with a library organised by Canon Rawnsley, newspapers provided and billiards enjoyed. The cue holders can still be seen today. During the war ladies met to knit for the troops, and tea & scones were served. This grew into the parish team and concert. 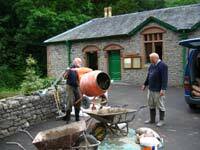 More recently the forecourt has been improved, toilet facilities improved and the kitchen modernised. 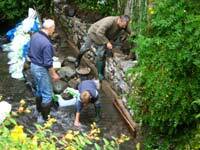 The foot of the wall in the beck has also been repaired. The hall continues to service as the focal point for the parish social activities and the work of the committee in organising events throughout the year is greatly valued in the community. 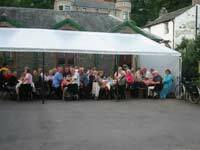 Sometimes these are social events- as in the photo below taken at a summer barbecue- at other times it can be the organisation of essential repair work led by local experts!